First Aid Certification Overview: Learn how to apply standard techniques for First Aid. After successfully passing our Free First Aid Test and after a successful purchase you will receive your certification and PDF card instantly, via email and on-site. You'll also receive your Hard Card within 2-5 business days. All courses follow the American Heart Association (AHA) and Emergency Cardiovascular Care (ECC) guidelines. It is our intention to provide individuals and businesses with the most budget-friendly and convenient first aid certification training that’s currently available. We understand that people seeking certification in first aid desire the most complete presentation possible, and that the class material is presented in an easily digestible format. That’s why we go to great lengths to ensure that all modules within the class are presented in the most easily assimilated fashion. Right from your own living room or den, you can learn all the details about how to manage burns, poisoning, bone fractures, emergency heart issues, and various types of flesh wounds. The beauty of it all is that you can proceed through the material at your own pace, even if you are interrupted, and need to take breaks along the way. Once you finish the class, you can immediately print off your own certificate at home, and you will have tangible proof that you are certified for first aid for the next two years. Regardless of whether this is your first certification or your 20th re-certification, this class will provide everything you need. If you have any questions about the class material or how it’s presented, you will be able to find the answers following this article. 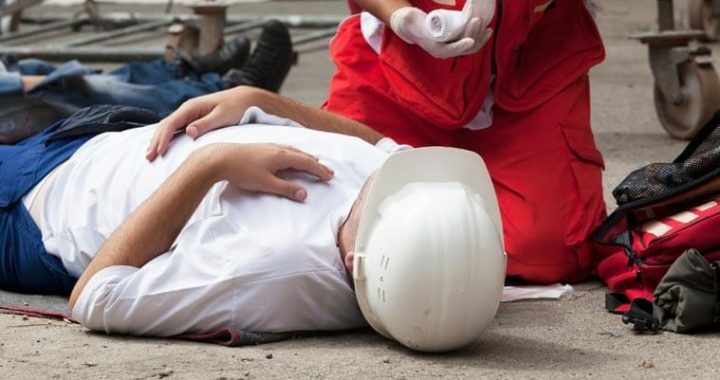 If you have ever been personally involved in an emergency situation, or if you have had one happen right before your eyes, you will understand how critical it is to have first aid skills in such situations. When you’ve been through this comprehensive first aid class, you’ll have the requisite skills to handle almost any emergency situation, until professional help arrives. In fact, that’s the whole concept of the program in the first place – it’s meant to provide critical care immediately, so that the first positive steps toward recovery can be made. While no one will be expecting you to have the skills of a medical professional, those first steps after an accident can literally be life-saving measures in some situations. This first aid class thoroughly covers the widest possible range of wounds and common injuries that might occur everyday. Below is a description of what’s included in some of the individual modules comprising this program. As you will see, it is a very thorough and balanced approach to addressing the skill sets needed to help someone survive those first critical moments after an accident, or unexpected medical condition. After you have finished all the modules of the class, there will be multiple-choice exam which is comprised of questions from the class material in each of the modules described above. Certification requirements call for you to correctly answer at least seven of the 10 questions on the exam. In the event that you failed to achieve the necessary seven correct answers, you will have the option to re-take the examination as often as needed, after refreshing yourself on the class material. For those who feel confident about their first aid knowledge and are re-certifying, it will be possible to bypass the material in the modules and proceed directly to the final exam. You will still have the same seven correct answer requirement in order to be re-certified, but if you’re confident in your ability to pass the exam, it can be a big time saving for someone who has a busy schedule. The cost of the first aid certification class is only $16.95 $12.95, which we intentionally keep at a low price in order to ensure that the greatest number of people are able to afford taking this valuable and life-saving class of instruction. You won’t even have to pay the class price until you have finished the entire first aid class, and by then, you will have seen that the value provided in these important first aid modules is far beyond the actual cost. The reason that re-certification is required every two years is simply to ensure that first responders keep their skills fresh and in good practice, so that they are ready to deliver first aid when called upon. It may be a little bit inconvenient for you to have to re-certify every two years, but the potential value to those people who need your skills makes it all worthwhile. The re-certification process itself can be completed in a very short period of time, and it can be tailored to your personal needs, with regard to how much or how little you desire to review. You may want to re-learn the entire class to keep all the details fresh in your mind, or you may feel that you have retained it all very well, in which case you’ll have the option to go straight to the final exam. What this kind of validity signifies is that class material does meet all requirements of the first aid program, and that the class itself is presented in a manner consistent with high-quality and ease of understanding. Curriculum has been written by American Heart Association trained providers. Beyond selecting a valid provider, you should also seek out a first aid certification program which covers all the important aspects of first aid in a manner that is clear and straightforward. This means you should look for a program that includes lots of diagrams and clearly written descriptions, so that you can have the best chance of understanding all the material, and putting it into practice yourself. It will be a great feeling for you to complete the class and print out your official certification document, after you’ve successfully passed the final exam. You’ll have a sense of empowerment in that you will be able to use your skills and knowledge to help others in need, and in some cases, possibly even to save their lives. Earn Your First Aid Certification Today!